Bohemian Rhapsody brings viewers an inside look on Queen's Freddy Mercury. Bohemian Rhapsody is a whirlwind of 2 hours and 13 minutes. The movie is about the former band Queen, paying special attention to lead singer, Freddie Mercury. The audience peeks into crucial points of the band’s timeline from their initial meeting to a historical moment in the band’s history: the Live Aid concert. Queen had an urge to play and create music with the most inventive and unorthodox practices. One record label wasn’t up for the wild creativity of the band and practically begged for a more mainstream, cookie cutter pop. The label refused to release Bohemian Rhapsody as a single, so Queen then refused to make any more music for this label. The band knew they were powerful enough to have a strong career without this label and they were correct. The band’s success was off the chart and record-breaking. They traveled around the globe and played in large venues across the world: US, Rio, Toyoko, etc. The acting in the movie was splendid! Rami Malek, playing Freddie Mercury, gave a breathtaking performance. His acting was superb and his lip-syncing abilities were effortless and flawless. At a few points in the movie, I genuinely believed I was watching the real Freddy Mercury. The costumes and set design added to the authenticity of the film, as well as the band member’s hairstyles which helped to measure what time period was being depicted. Did you enjoy Bohemian Rhapsody? Rami Malek has already received a Golden Globe for Best Actor in a Motion Picture Drama and is nominated for an Oscar. Not to mention that the film itself won a Golden Globe for Best Motion Picture. 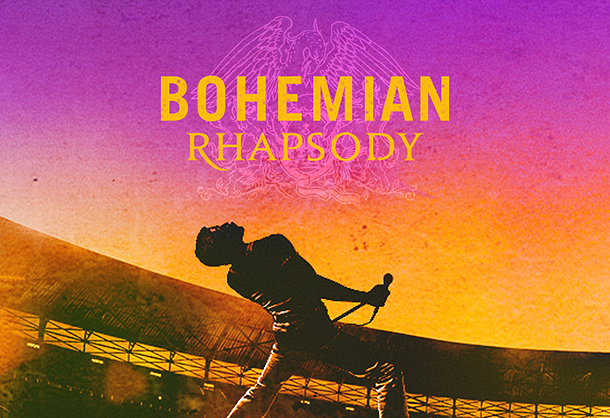 Bohemian Rhapsody focused mainly on the music, with an underlying story of Freddie and his search to find himself and what exactly he desired out of life. At the end of the movie, we were even able to see the start to his fight against AIDS. I thought the movie was incredible and I’m so happy with all the praise and awards it has been receiving, it deserves a 10/10!